Battery-powered lawnmowers offer the same level of power as their petrol-powered equivalents, without compromising on performance. The difference is that you will be mowing your lawn with an environmentally friendly product, with no cables, petrol or fumes, and with limited noise, vibrations and minimum maintenance requirements. STIGA battery-powered grass trimmers and brushcutters are designed for users looking for an environmentally friendly tool with no power cord for edging and cutting the grass. The range includes products to suit different garden sizes, with the power needed to get the job done. The STIGA range of battery-powered chainsaws includes lightweight and precise tools designed for domestic pruning and logging work. These well-balanced, safe tools combine power with the benefits of batteries: complete freedom of movement, zero emissions, reduced noise, vibrations and maintenance. 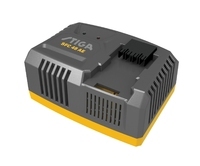 STIGA battery-powered multi-tools combine one single power unit and several accessories; you can care for hedges and branches that are too tall for standard pruning and finishing tools, with all the benefits of battery power: reduced noise and reduced emissions, vibrations and maintenance.